Cross the stone bridge and enter the arched doorway to a place where dreams come true. This delightful LEGO® replica of the Walt Disney World® Resort Cinderella Castle is full of authentic details for you to explore. Step into the grand main hall with its mosaic-tiled floor, suits of armor, wall-mounted shields, grandfather clock, ornate chandelier and golden lamp, then venture through a myriad of beautifully detailed rooms featuring familiar decorative details. Create your own Disney adventures with the 5 included minifigures: Mickey Mouse, Minnie Mouse, Donald Duck, Daisy Duck and Tinker Bell, or add characters from your own collection for endless play scenarios. From its intricate facade, ornate balconies and flag-adorned towers, to the soaring golden-spired main tower complete with fireworks function, this amazing model features unsurpassed detail and magical surprises that will set your imagination free! 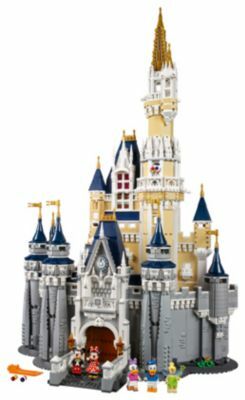 The The Disney Castle (71040) Lego set is available from the sites below. However, they do not offer delivery to your selected region. The The Disney Castle (71040) Lego set is no longer directly available from the sites below. However, 3rd party partners of these sites might still have the set available. Alternate description Explore this magical LEGO® replica of the iconic Walt Disney World® Resort, featuring a highly detailed facade, an array of Disney-themed rooms and 5 Disney minifigures. The LEGO® Disney Castle measures over 29” (74cm) high, 18.8” (48cm) wide and 12” (31cm) deep.